Good or bad? well I’ve been doing some. Firstly on a pair of jeans that I’ve wanted to do forever, but was worried incase the inner leg seam wouldn’t go through the sewing machine. 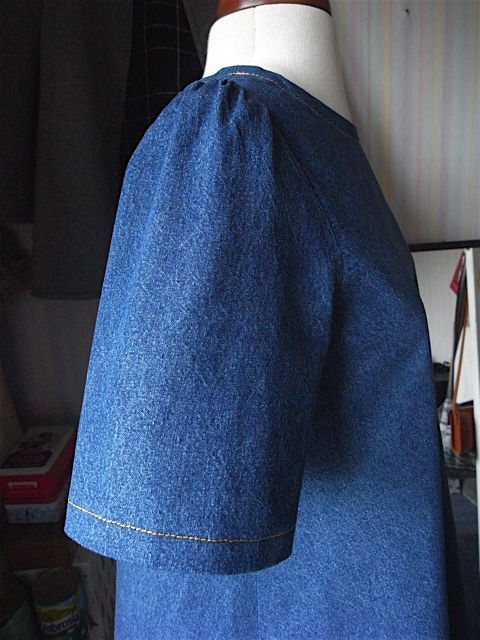 I think I mentioned this when I last altered a pair of jeans and someone very kindly offered the tip of hitting the seam with a hammer. well I went one better and hit the seam with a mallet, yes I did! And have to say it worked a treat. 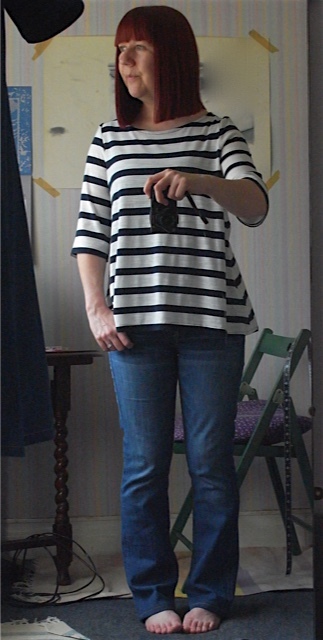 I don’t have a before pic but trust me the jeans were about 3 miles too long, but now they are perfect. 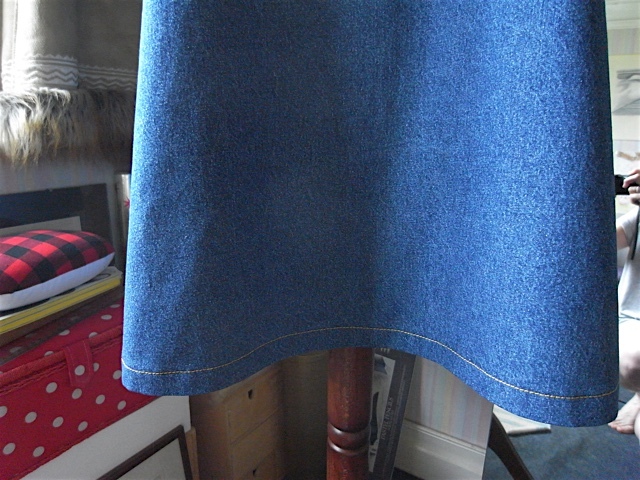 And then I went and altered this denim trapeze dress. 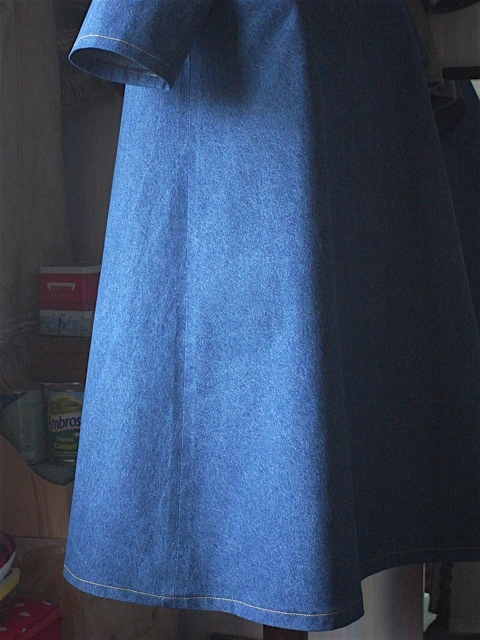 Made it shorter and also shortened the sleeves. 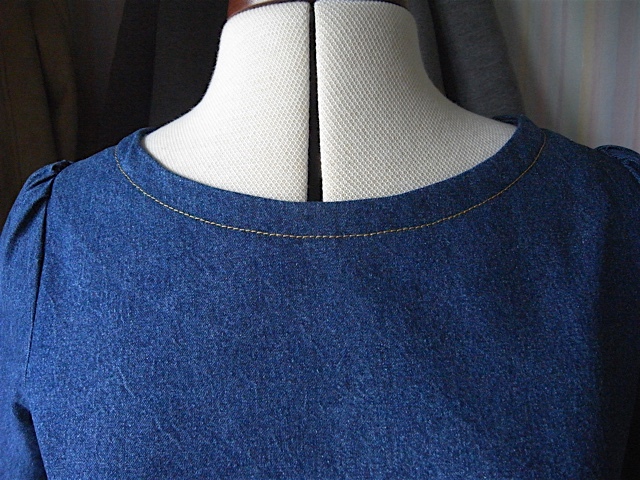 and then top stitched the hem, neckline and sleeve hem. I’m definitely pleased with the topstitching but not sure about the rest yet. I haven’t worn it since the alteration so watch this space… I might regret it come the winter! I have worn it now! Didn’t think I did at one time, always thought of myself as more of a spotty/dotty person, but it seems I’m loving stripes just as much. Maybe this is the difference when you make your own clothes, you can actually make something that suits you. 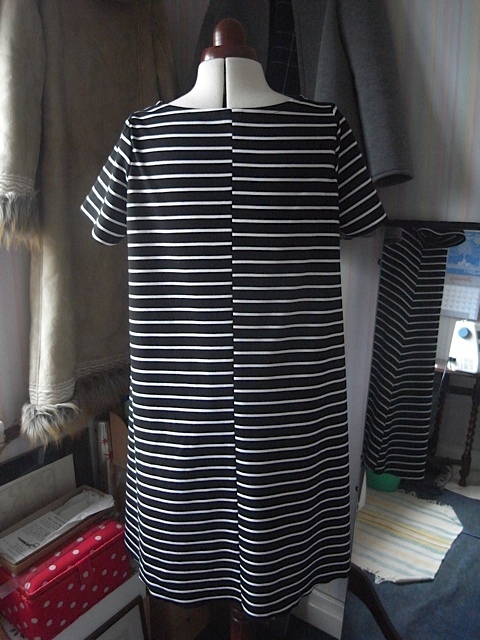 So without further ado, meet my stripy Trapeze dress in this gorgeous ponte roma jersey from fabricgodmother .co.uk, its quite thick but also drapes beautifully. And best of all it doesn’t crease whilst wearing. And it was lovely 2 day project, could have done it in a day but I didn’t want to rush it, as I sometimes just simply love the making process. I had a horrible time trying to match up the stripes at the back and just gave up in the end. 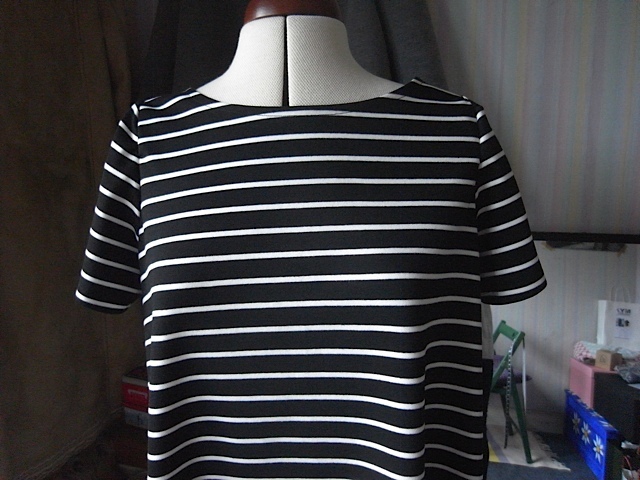 It was either have the stripes match down the centre back and have the stripes be wonky on the front or have them mismatched at the back and horizontal and straight at the front. Quite bad for the eyes if you stare at it for too long, fortunately its at the back and I can’t see it. Sides are not too bad, not perfect but a lot better than the back. Think it looks quite good across the top too. 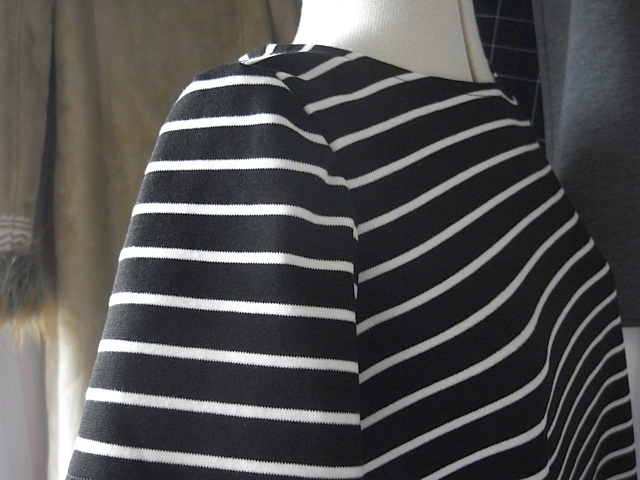 And just look at those stripes going from sleeves to bodice. Not bad eh? I really love the way to hangs, and it feels really really good on. 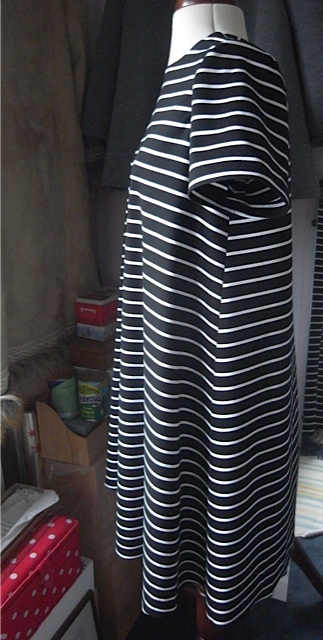 So there we have it, Trapeze dress No: 5 I think. Oops! I think maybe a few more then I’m done… Or not!